1. Comprehensive field trip notes in the form of PDF files sent to the field trip organiser. If any field trip member would like their own copy, either Email me, or ask your field trip organiser for a copy. Field trip guides should be available to all members of the field trip. 7. A small exhibit of the fossils found on Sheppey or Folkestone, including most of the main animal groups to be found. 8. For small groups the oportunity to come to my house and view my collection. The island is a great place to run field trips. Together with my mate the late Jim Craig, I have been involved in quite a few. The images to the right are of a group of school children from Borden Grammar school that I took out in the past. They all found some sharks teeth and fossil crabs. 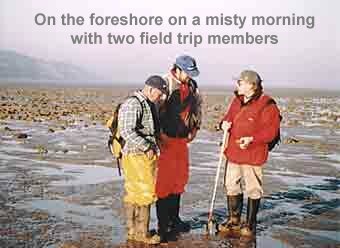 Groups of amateur and professional Geologists and paleontologists come from all over Europe, and occasionally elsewhere to study or collect Sheppey's fossil Flora and Fauna. As the section is coastal, and subject to continuous erosion, fossils can be found throughout the year. 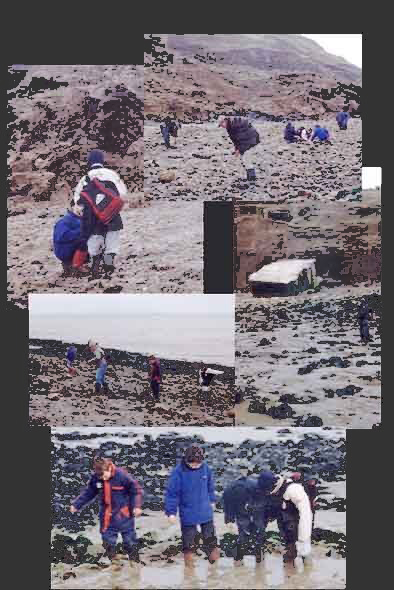 However after successive wet seasons collecting can be inhibited by the shear quantity of oozing mud that flows down from the cliffs and smothers the beach. This in turn is washed as slurry and silt onto the foreshore covering the collecting area and hiding the fossils. The lower picture demonstrates this well. The boys, as boys will, have stopped collecting because the pool of slurry is a far more attractive thing for them to play in. Who got stuck most? A great game if you are 12 years old. One of the boys found an Otodus obliquus tooth while on this trip. They are not common on Sheppey. The left hand picture shows the conditions with which we have to work. 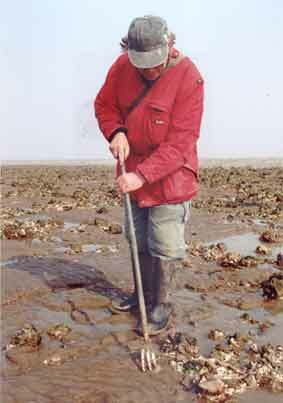 I am standing out on the foreshore in my wellies, smothered in mud and silt, hunting for phosphatic nodules. For every hundred or so that are found one may contain fossil material. Very occasionally a stunning crab, or fish head can be found. The London clay does not give up it's treasures easily. 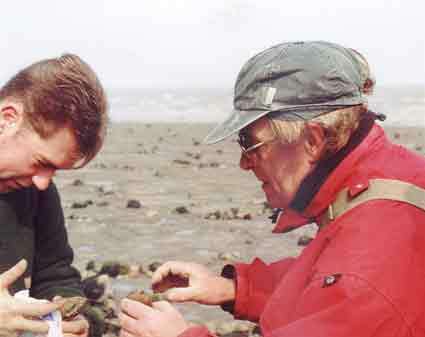 The right hand picture shows Martin Rayner and myself inspecting the nodules that had been found. Both of these pictures were taken on a field trip that I hosted last year.